In nearly 13 years of owning the London Knights of the Ontario Hockey League, Mark Hunter has seen a number of players go from his organization to NHL stardom, among them Patrick Kane, John Tavares, Corey Perry and Rick Nash, so he has a pretty solid grasp of what it takes for a player to make it to the big time. And when he watches defenseman Nikita Zadorov, he sees another player ready to make that leap. "His potential is unlimited," Hunter told NHL.com. "When you see him skate in practice and games, you don't see a guy that nimble for that size, 6-5 or 6-6." The 6-foot-5.25, 230-pound blueliner has three goals and 18 points in 51 games in his first season with the Knights, and his team-best plus-30 rating is seventh in the league and tops among first-year OHL players. And for a player who enjoys playing physically and using his size and strength to his advantage, he only has 46 penalty minutes. NHL Central Scouting placed him No. 30 in its midterm ranking of North American skaters for the 2013 NHL Draft. "Nikita is a big man who skates very well," Central Scouting's Chris Edwards told NHL.com. "He has very good mobility and his backwards skating is about the best in this year's draft. He will take the body and battles hard along the boards. He uses his long reach well and is an effective pokechecker." Hunter didn't have to go far to find Zadorov, a Moscow native. After watching Zadorov play at the 2012 World Under-17 Challenge in Windsor, Ontario, Hunter was more than just intrigued. "He's huge, number one," Hunter said. "He skates well for a big man. He's got a good shot, he can pass the puck. He's got the whole package. He's just got to round it out and put it together on a game-in, game-out basis." 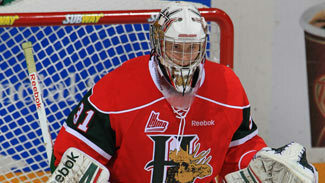 When Hunter learned Zadorov was interested in coming to North America, he traded with the Peterborough Petes to move up to the ninth spot in the 2012 CHL Import Draft to select Zadorov. After that, it didn't take much convincing to get the player into town. Zadorov had spent the previous season playing in the MHL, the top minor league in Russia, but said entering his NHL draft year, he had his sights set on North America and the increased exposure to NHL scouts it would bring. "I want to play in the NHL," Zadorov told NHL.com. "It's my dream and I want to play only here." It's worked well, as not only has Zadorov excelled in London, he was one of 40 players to take part in the 2012 CHL/NHL Top Prospects Game. His on- and off-ice skills and fitness testing was impressive, and during the game he was a plus-2 with two penalty minutes and a bone-rattling check on Val-d'Or Foreurs forward Anthony Mantha. "It's best of the best and it's a very hard game," Zadorov said. "Testing wasn't hard, wasn't like the [NHL Scouting] Combine. It's a pretty hard game because everybody wanted to play well, because scouts come to see the guys." They've had a lot to see in London, with forwards Max Domi and Bo Horvat also expected to be high draft picks. But Zadorov stands out both with his size and how quickly he's adapted to the style of play and lifestyle in North America. Zadorov, who couldn't speak any English when he arrived in London over the summer, credited former Knight and fellow Russian Vladislav Namestnikov with aiding his transition. "When I came to London, the first two weeks, he helped me every day," Zadorov said. Also helping has been Zadorov's mother, who lives with him and helps him with some tastes of home. "Every day she's cooking Russian meals," Zadorov said. "He's come a long way as far as knowing what we want," Hunter said. "It's a little bit different hockey here because of the smaller ice surface. It took a little bit of an adjustment period from that standpoint. He understands. He's got a good brain for the game. He's a big guy that can skate and drive the net and do things offensively that a lot of other players are not capable of doing. "He's an intelligent kid. He's grown so much -- he's so big. We knew he was going to figure it out. He's not scared. He hits people, he finishes his checks. There's so much to like about him it's ridiculous." Hunter likes Zadorov so much he compared him to a former teammate -- Hall of Fame defenseman Larry Robinson. "He reminds me of a smaller version of Larry Robinson," said Hunter, who played with Robinson for three seasons with the Montreal Canadiens. "He used to drop his shoulder when he'd get going up the ice and drive the net. … [Zadorov] showed me a couple times he's done that, where he's drove wide and put his shoulder down and drove to the net. He can do that which Larry … I played four years with him and I saw him do that numerous times." Hunter understands comparing a 17-year-old in his first season of junior hockey to a six-time Stanley Cup champion and Hockey Hall of Famer is tough, but that's how much he thinks of Zadorov. "He's got all the tools to play in the National Hockey League and all the tools to be a real good National Hockey League player," Hunter said. "The sky's the limit for this young man. Really is. He's got a great future ahead of him."